Luke Wallace is a back-row of immense promise who has the benefit of learning the game off the likes of Nick Easter and Chris Robshaw. 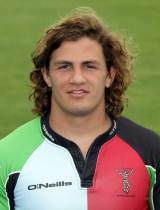 The former Tonbridge School pupil turned out for Sussex U18s but was quickly fast-tracked through the Harlequins ranks. Wallace took his bow for Quins in the 2010-11 season in the Anglo-Welsh Cup and soon secured Premiership game-time. Come the 2011-12 season, Wallace shone for Quins during the World Cup and although he was used more often than not from the bench in the second-half of the campaign, he still put in a solid shift. Wallace's efforts were recognised by Premiership Rugby who nominated him for the discovery of the season award.